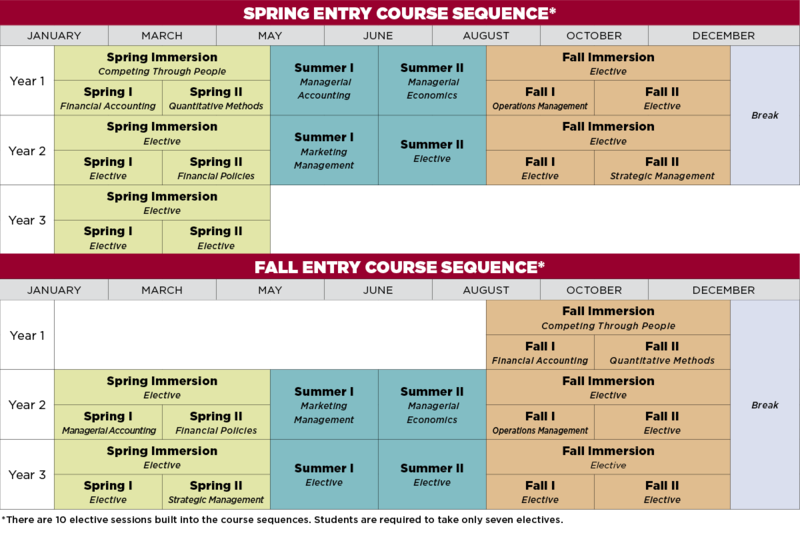 The academic calendar of the Professional MBA program is anchored by six, seven-week terms and also includes immersion courses that typically meet three full Saturdays over a 14-week period on the USC Columbia campus. In a seven-week term, students take one course that meets one night per week from 6 p.m. to 9 p.m.
Extensive details about course meeting times and/or scheduled Saturday class dates will be found on the course syllabus. Syllabi are available on the Professional MBA Blackboard community website. Current Professional MBA students: consult your course's syllabus for the updated Saturday class day schedule. Incoming students can start the Professional MBA program in the Spring I or Fall I terms. Connect with a recruiter to learn more about the Professional MBA at the Moore School - details about the curriculum, recruiting events, study-abroad experiences and more.